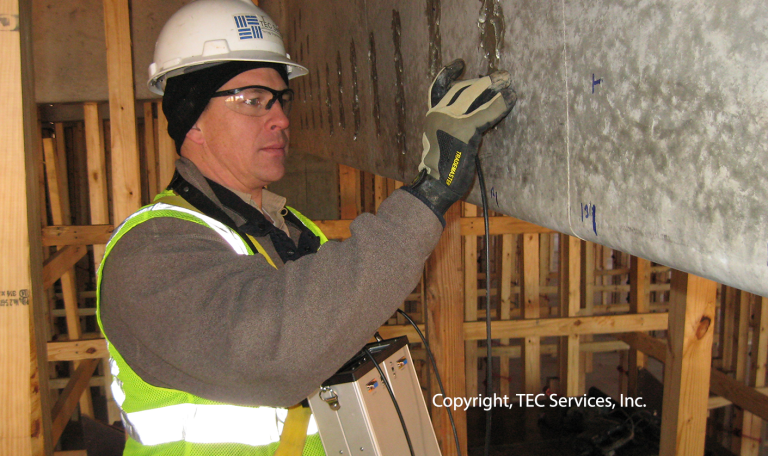 The nondestructive ultrasonic pulse velocity technique measures the velocity of stress waves traveling through concrete. Ultrasonic stress waves are initiated at one face of a concrete member when a transducer is excited by high voltage pulses. This ultrasonic stress wave pulse travels through the concrete and is received at the opposite face of the concrete member by a similar transducer. This signal is amplified and can be displayed on an oscilloscope. Time measurement circuitry in the V-meter determines the elapsed time for the stress wave pulse to travel through the concrete. The pulse velocity of the concrete being tested is determined dividing the measured path length by the elapsed time measured by the V-meter. For an investigation, the velocities of stress waves pulses propagating in the compressional mode are measured. The compression wave velocity through the concrete is related to the elastic modulus and the mass density of the concrete as well as other factors. The elastic modulus is related to the compressive strength of the concrete and is dependent on the constituents of the concrete as well as the general in-place quality. The calculated pulse velocity is dependent on the actual wave pulse path length traveled through the concrete. If the path length is interrupted by a crack, zone of honeycombing or some other discontinuity, the wave energy will attempt to circumvent the discontinuity. The resulting time delay will indicate lower velocities. In summary pulse velocity data, when properly analyzed, are indices of the strength, density and quality of the concrete. 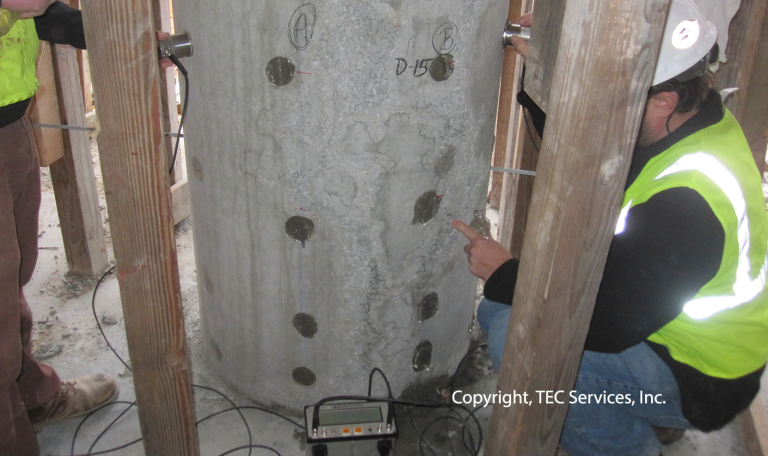 This technique is described in ASTM Method C 597-83 (Reapproved 1991), “Standard Method of Test for the Pulse Velocity Through Concrete”.